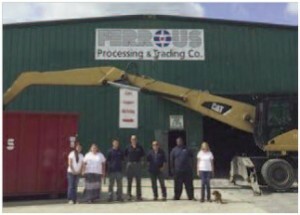 With a welcome by the local Chamber of Commerce and an article in a local newspaper, Ferrous Processing and Trading (FPT) received a warm reception from Shelbyville, Tennessee for its newest outpost. The metals recycling giant, based in Detroit, Michigan, recently launched a six-acre yard and 15,000 square foot metal shop in the strategically located town. Located between Nashville and Chattanooga, the Shelbyville facility is the company’s first yard and processing facility in Tennessee. FPT’s Franklin, Tennessee location hosts an office for overseeing the company’s Southeastern US operations. The yard employs seven full time and one part-time employees. “We intend to be an active part of this vibrant community – environmentally, socially and fiscally – and thank them for the hospitality they have extended to us. As with our other locations, we will also make it a priority to work closely with local law enforcement,” explains Sulak. With its proximity to several automotive suppliers in the southern region, the new yard will bring enhanced operational and logistical efficiencies. Sulak also predicts more direct control over products and quality, as well as the ability to localize critical accounting functions.